Just thought I'd start the new year by sharing some of my personal favorite dishes from 2011. Here are my top 6 in no particular order. Making gnocchi was so much fun. And the mushrooms with the beer made a delectable sauce. This picture from my beer dinner includes the crispy sage leaf which I think took the dish to another level. These poppers I made in September were so crunchy and cheesy and yummy. The sweet apricot sauce was a hit and it was just right paired with #9. This was definitely a favorite of mine. It includes a combination of some awesome flavors: smoked salmon, potato, mango, Festina Peche, and cilantro. These sandwiches paired with Jai Alai IPA from Cigar City were so good! 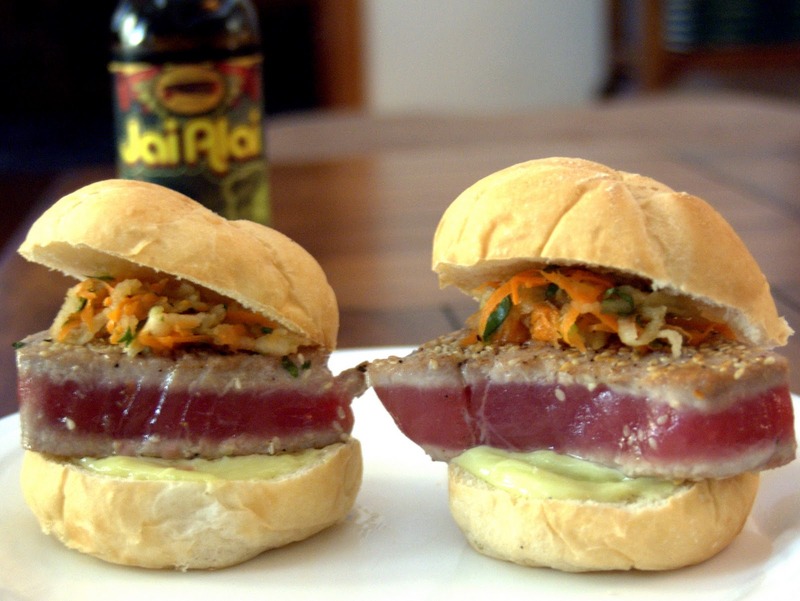 The wasabi mayo, the apple carrot slaw, the perfect seared tuna. All together in one bite = amazing. I went all out for my beer crepes and made each crepe with a different beer and different toppings. There was definitely something to love in each one. This is a basic you can't really go wrong with. Perfect batter and the buttery dipping sauce was so delicious.